Alex Risdale is a professional chef working in London. 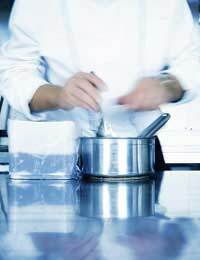 He has more than 10 years' experience in various parts of the catering industry. He has worked in fine dining restaurants, cooked for distinguished clients in their homes and on their yachts, worked on cookery book photo shoots and for some of the best caterers. Q: Is it possible to make delicious dinner party desserts without sugar? A: "Many delicious desserts contain no sugars other than from their own juices or from natural sweeteners such as honey. Think of the simple summer classic of strawberries and cream, for example! The best seasonal summer fruit needs no help from sugar. In winter things may be a bit trickier if you want to tuck into a stodgy classic pud. A warm baked bramley apple with honey, nuts and dried fruit might be tempting however." Q: What ingredients might you use to replace sugar? A: "Dried fruit, honey and cocoa can all be used to add sweetness. There are also many manufactured products available to cater to the needs of people who don’t eat too much sugar." Q: Should you be wary of using too much artificial sweetener in cooking? A: Personally I feel no manufactured product can compete with natures natural sweeteners. However, if you want to make something when there is no alternative but to use an artificial product I cannot see a problem. I would always suggest, however, that you read the label carefully and follow the manufacturer's instructions when using it. Q: Could you please suggest a starter, main course and dessert you might serve at a sugar free dinner party? A: I think most starters and main courses can be made without using sugars. There is no real problem in eating well without sugar in these courses. How about a delicious celeriac remoulade, pear and smoked eel salad with crispy bacon followed by slow braised shoulder of lamb with root vegetables? But dessert also doesn’t have to be a challenge when not using sugar. Keep it simple in order to guarantee success. I would serve something such as raspberries with Greek yoghurt and toasted oats with heather honey drizzled on top. Then after dinner, I would serve some fine cheeses with fresh and dried fruit such as figs, dried apricots and grapes. Q: Could you possibly give us your recipes for your sugar free dessert? A: "Here is the recipe for Raspberries with Greek Yoghurt and Toasted Oats. It serves four people. Toast oats on a baking sheet in a 160 deg C, gas mark 3 oven for six to eight minutes or until golden. Then lightly whip the cream and fold in the Greek yoghurt. Divide the raspberries into four large wine glasses, ramekins or similar, and lightly press to release some juice. Top with the yoghurt mix. Refrigerate until needed. When ready to serve top with the oats and drizzle with honey."